Horses are special gentle creatures who live inside our civilization, subject to rules and duties they can barely understand. We give them jobs, and in return for their work, they get athletic health, extended lifespans, places to live, food to eat, specially developed supplements and foods and the companionship of humans and other horses. But their gentleness, stoicism, and willingness opens them to maltreatment, from well-intentioned people as well as from those who are indifferent to the internal state of the animal. When an authoritative clinician encourages practices that abuse the animal – or provides sanction by silence – there’s an even more serious problem. They deserve to be held accountable. 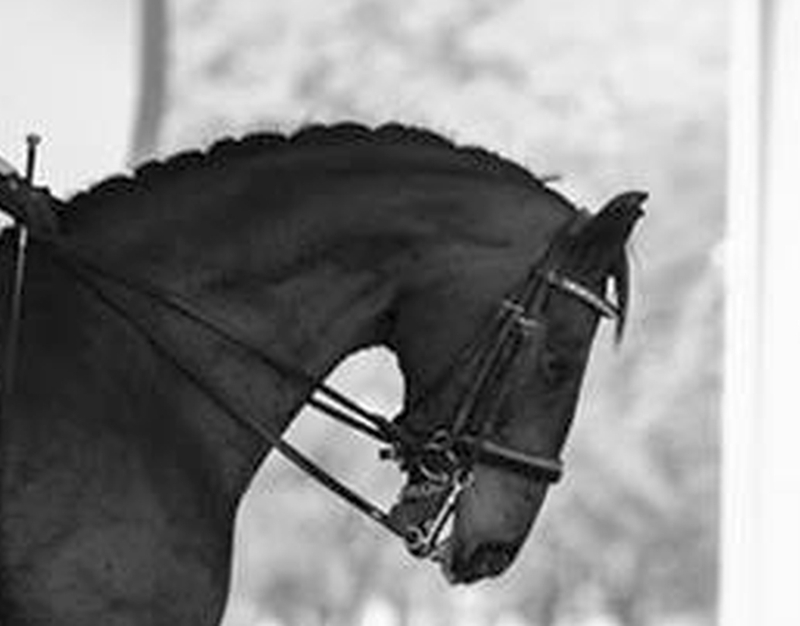 If you’re an English rider, for instance in dressage, you may see a look in this horse that you aspire to. 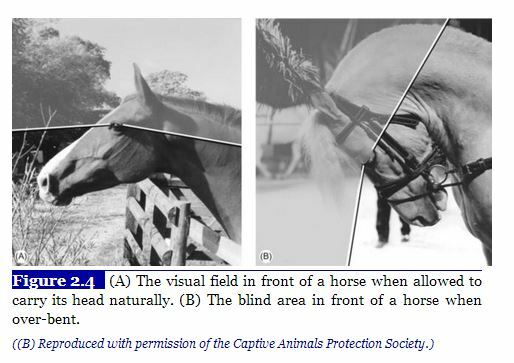 But the reality is different from both of these perspectives, and, far from listening to a whisper from the horse, which Kyrklund claims we should do, this clinician is totally ignoring a horse whose body language is practically screaming distress. This is a closeup of the horse’s head from the prior picture. The horse is on a tight rein. According to its foundation training, this should require it to back up. But since the horse is not backing up, either the rider is providing leg pressure to push the horse forward into the rein pressure, or the horse has been detrained to the bit pressure. If it is detrained, it still feels the curb chain digging into its chin, it still feels the double bridle bit pressing hard into the roof of its mouth and hard on its gums, but it has now learned to do nothing about this discomfort except duck its head. On the way to that state it has no doubt been repeatedly corrected for trying to avoid this discomfort. (clinic host): Just so you are aware, in this moment the rider and horse were on a break. At the time this photo was taken, the horse was at the halt and only playing with the bit. You should not give such a strong opinion from a picture that shows a moment. I LOVE her philosophies! She trains the horse’s mind as well as body. Don’t be too quick to judge Kyra by a moment in a photo of a horse that is not in training with her, but there to learn from her. I have her video’s and I have never seen her advocate hyperflexion in it. The horse is at a halt and is probably bored and playing with the bit. 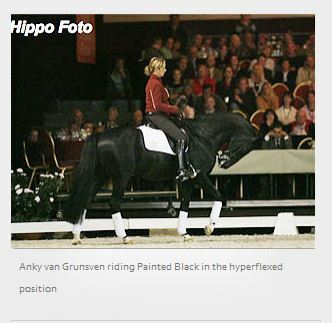 Kyra does NOT promote hyper flexion, and it is clear the rider is not pulling on the reins. Sheesh!!! If you have nothing nice to say then DO NOT COMMENT!!!! People don’t want negativity in their comments. She is one of the “greatest” trainers alive today. I am sorry I had to miss this clinic. I have seen her many times and yes you are right [defending poster] she does NOT!!!! Promote hyper flexion, quite the opposite. I believe she was one of the people that was instrumental in making the world aware of how WRONG, it was and is”………………go Kyra!!!!! And to ensure that we do understand where the clinician positions herself on hyperflexion (given the above assertion that she is against it)… let’s take a panel in which she particpated at 2006 Global Dressage Forum (http://www.eurodressage.com/equestrian/2006/11/06/sjef-janssen-dr-rene-van-weeren-and-anky-van-grunsven-coaching-and-hyperflexion ). At best, a lukewarm reaction to this demonstration position, which as we have seen above, is medically harmful. So the clinician doesn’t aggressively correct her students, is weak when on panels to comment on the topic. In effect, she gives sanction to this abuse. Her supporters assert various things in defending this image. Can there be any doubt about that? Other defenders stated that the horse is “playing with the bit”. Let’s take a moment and think about that. The nature of nerves in any creature that has nerves is that, with the exception of pain neurons, a continuous sensation will gradually disappear into habituation (http://en.wikipedia.org/wiki/Habituation). 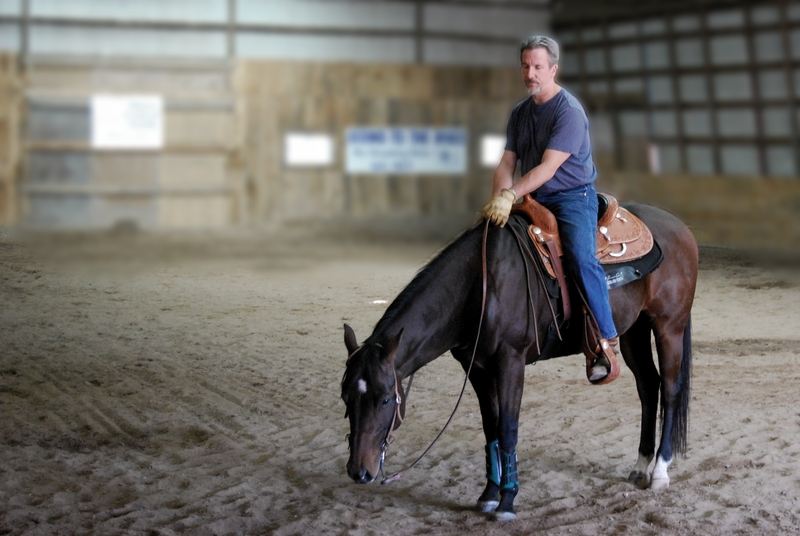 The saddle, the headstall, the cinch – all are effectively invisible to the horse. 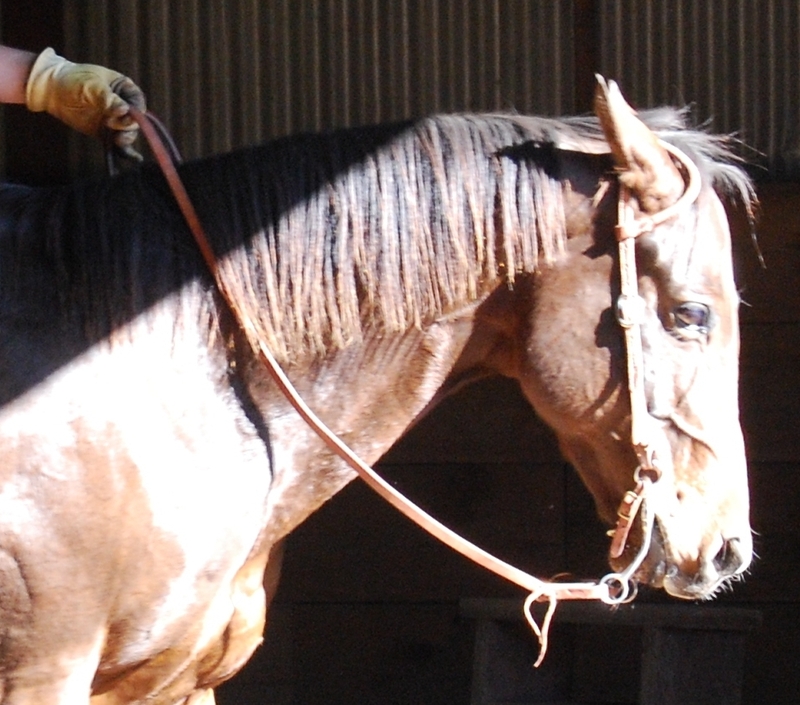 The horse does not suddenly start to play with saddle or cinch unless something changes or is wrong. What would make a horse play with his bit, if the bit were still in his mouth and he were used to it? A relaxed horse does occasionally move the bit in his mouth. This is an effect of moving the lips and teeth while salivating and does happen at rest. 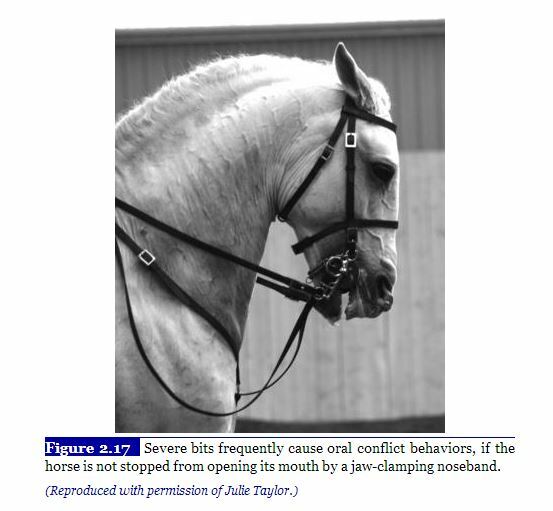 But the mouth is closed and the lips are quiet, not peeled back from the teeth as this horse shows. A gaping mouth position is simply the result of excessive pressure or stress. At the end of the day, trainers, riders and clinicians have a responsibility to the horse. To make sure that the horse has a good life in its work. A responsibility to stand up for the horse and for the right way of treating horses. The bad practices don’t have to be as damaging as Rollkur (http://horsesforlife.com/RollkurPictogram), or the Big Lick (http://www.hphoofcare.com/lick.html) – but however serious a bad practice may be, trainers, riders and clinicians have the burden of bringing factual information to bear in an non-aggressive way, doing everything possible to first change the minds of those who follow incorrect practices innocently, and then to point out and bring peer pressure to bear on those who persistently do so in the face of facts and the known welfare of the horse. It’s very difficult to scientifically prove intelligence. Animals pose special difficulties because their intelligence is bound to be different from ours – where we have a vivid, linguistic introspective life, animals largely lack language at all, and certainly lack the expressiveness of human language. And horses, of course, except for a few distinct utterances without any apparent syntax, essentially have no verbal expression of their thought. Humans have had a tendency to test animals like horses with problems that humans are especially good at solving and which are essentially irrelevant to horses. Herd animals living on vast rolling plains will have no need for the ability to solve mazes – unlike monkeys and birds and mice, each of whom must daily solve two and three dimensional mazes to survive. Yet horses do have an alien intelligence and it is there to observe in the semi-controlled experiments of everyday life and horse training. Today, I continued a new training effort to get Gunsmoke to be willing to be separated from his best and only friend, Lensman. And in the process, I discovered something that had been in front of me all along, but which suddenly shed light on the nature of equine intelligence. I don’t mean they know that an electric fence hurts and so they stay away from it, effectively but unconsciously segregating themselves behind it. I mean that they understand the meaning of “fence” as a concept. Lensman is Gunsmoke’s BFF (Best Friend Forever). That doesn’t mean that Gunsmoke follows him around and acts “lovey” with him – it means that Lensman is not allowed to go where Gunsmoke can’t follow him (and direct his actions). If Lensman should leave, then Gunsmoke will show his anxiety by pacing and sometimes nickering or even keening for him with a loud call. I can typically ride Lensman in the indoor arena while Gunsmoke is in his stall (though that took some training itself), but Gunsmoke cannot be outside while Lensman is inside without triggering the anxiety. Now these two horses are housed in a 100 x 100 paddock with a shelter in the middle of it, and even some fencing down the center such that the shelter and an opening in the fence are the only two ways to get from one side to the other. It is easily possible for these horses to be separated in the paddock – for instance, the water is on one side and the hay is on the other. The horses will often sleep on separate sides of the fence. And it is perfectly possible for them to be in places where they cannot see each other, such as inside or behind a wall of the shelter. But they are not upset by any of this, and don’t go running off to find their hidden other. But let me halter Lensman and take him outside the fence, even only a few feet outside the fence, and Gunsmoke will nicker and stand close. What is he saying? He is saying that he understands the fence. It’s not me and it’s not the halter. I can halter Lensman and walk around in the paddock. Gunsmoke may follow us, or not, but there is no separation behavior. But the moment Lensman is outside the fence, I can only infer that Gunsmoke believes one or more of these things; a) Lensman is unreachable because of these fence, b) Lensman is going to go farther away and disappear and be unreachable, c) Lensman + halter + Mark + fence means Gunsmoke will be alone. “Alone” in this context is a bit of a complex thing. Obviously Gunsmoke doesn’t worry about this when Lensman disappears behind the wall of the shelter (he therefore has a concept Piaget called “persistence of object”, which humans don’t acquire until emerging from infancy – the idea that something still exists even when it can’t be seen). So even when he can’t see Lensman, if he has no reason to believe Lensman has left the paddock (e.g. through the instrument of myself and the halter plus the blocker of the fence), then he is comfortable that everything is OK. But again, the fence changes everything. Lensman being led away into a building or another room changes everything. Because the fence means Gunsmoke can’t join Lensman if he wants. And this means he “gets” fences. Understand how this differs from a mechanistic interpretation of horse intelligence. In that interpretation, the horse has an instinct to be close to the other horse and if blocked when walking toward the other animal, expresses distress. But in reality, Gunsmoke doesn’t experience distress when Lensman is away or hidden. He doesn’t even express distress when Lensman is across one of the paddock internal fences. He only expresses distress when Lensman is taken outside the fence by someone. This means he understands the difference between Lensman being taken away and Lensman wandering around the paddock. It means he understands the difference between inside the fence and outside the fence. This is not mechanistic – this is cognitive and reflective of a certain type of intelligence. A non-human intelligence. But intelligence. And an intelligence connected to emotion. Why is this important to training? Because BFF anxiety is prevalent in paired horses (even geldings like our guys), and you will need to know the basis for it in order to have any hope of eliminating it. It will require proving to the horse with the anxiety that his buddy will come back and that going outside the fence with a human is no worse than his buddy wandering into or behind the shelter. You can’t do that unless you know and empathize with its causes.